Doing a Little Spring Cleaning Early? 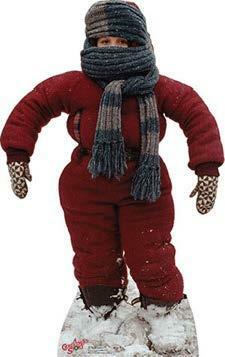 Randy from the movie "A Christmas Story." This might be how some employees feel after they get all their PPE on. When handling pesticides, we all need to use personal protective equipment. It is aimed at preventing hazards or reducing your risk at the source. It is typically an easy measure to follow, but sometimes there is reluctance due to comfort or attitude. The best measure of protection may be available, but it is up to the wearer to put it on. When getting the right equipment, size matters. With some forms of PPE, having the right size that correctly fits the wearer can be crucial for ensuring the correct level of protection. This holds especially true with respiratory protection equipment, where fit is critical. When a respirator is required by the product label, a medical evaluation to ensure the handler is physically able to safely wear the respirator is also required. A fit test will ensure the respirator fits correctly. Please check online for doctors or facilities that can conduct fit tests. Equipment can differ in shape and size. Be sure to check out different brands to find the right fit. Something that fits right is more likely to be used and worn. In addition to physical constraints, attitudinal and behavioral factors are also important. Determining the fit of PPE is very important so that the wearer will utilize the equipment. But it is also important to understand why it is necessary to wear the protective equipment. Good communication helps to avoid conflict. If employers insist that the equipment must be worn, sometimes the employee's attitude is "why should I?". Engaging with employees on the potential for exposure and the level of toxicity will allow them to fully understand the risks associated with the products they are using. It is good idea to develop a risk assessment plan on how to prevent or even mitigate potential hazards. Research has shown that managers at all levels in an organization need to recognize the need for PPE. It is important that those with management or supervisory responsibilities are aware of the hazards involved; know of the possible consequences of exposure; and recognize and accept the role that correctly selected and worn PPE can play in controlling such risks. Potential wearers have to believe that the PPE will protect them, and PPE which gets in the way or is uncomfortable will be less likely to be worn. It takes commitment and belief both from managers and from employees for an effective PPE program. This can particularly be the case where managers and supervisors themselves are 'old hands'. Research has identified that older workers can provide a potentially negative influence as they perhaps have a different perspective framed by prior experience and practice. Changing knowledge about workplace hazards also plays a part and older workers in particular might find it hard to accept that a particular chemical is now seen as hazardous when its use was once commonplace. Of course, having seen the effects of workplace hazards on their former workmates, they can also be a positive influence in encouraging younger workers to protect themselves. As with other workplace health and safety issues it is important for all employees, especially managers, to recognize that they have a role to play in health and safety, and that their attitudes and behavior can be a major positive (or negative) influence. Encouraging an inclusive health and safety culture, where such issues are the responsibility of all, not just a designated person, will make a valuable contribution to the subsequent effectiveness of any program. Faced with workers refusing to put on their PPE, you first need to pin down their objections. Is it uncomfortable to wear, is it too heavy, does it restrict movement? In these cases, good communication, effective consultation, better training, and reasonable adjustments should be all that is needed to head off the problem. No matter how carefully chosen, the PPE will not be effective if it is not worn. We often think of cleaning in our homes, buildings, sheds, or barns in the spring, and if you have caught any of the new cleaning show on Netflix with Marie Kondo, you have probably wanted to give the KonMari way a try and start to let go of those items that are unwanted or unused. One of those items might be pesticides. The issue is that pesticides can't just be tossed in the trash. Pesticides need to be disposed of properly to prevent accidents and to protect the environment. When it comes time to purchasing pesticides, it is important to purchase only what you will need for the job. If you can't use it all, maybe speak with a neighbor to see if they are dealing with a similar pest issue and go in together on the purchase of the product. If there is remaining pesticide that cannot be used, you will need to follow the disposal instructions on the pesticide label. "Pesticide wastes are acutely hazardous. Improper disposal of excess pesticide, spray mixture, or rinsates is a violation of Federal Law. If these wastes cannot be disposed of by use according to label instructions, contact your State Pesticide or Environmental Control Agency, or the Hazardous Waste Representative at the nearest EPA Regional Office for guidance." "Pesticide wastes are toxic. Improper disposal of excess pesticide, spray mixture, or rinsates is a violation of Federal Law. If these wastes cannot be disposed of by use according to label instructions, contact your State Pesticide or Environmental Control Agency, or the Hazardous Waste representative at the nearest EPA Regional Office for guidance." "Wastes resulting from the use of this product must be disposed of on site or at an approved waste disposal facility." "Do not puncture or incinerate! If empty: Place in trash or offer for recycling if available. If partly filled: Call your local solid waste agency or (toll free number of appropriate contact) for disposal instructions." "If empty: Do not reuse this container. Place in trash or offer for recycling if available. If partly filled: Call your local solid waste agency or (toll free number of appropriate contact) for disposal instructions. Never place unused product down any indoor or outdoor drain." Labels for antimicrobial household products may bear the following disposal statement: "Securely wrap original container in several layers of newspaper and discard in trash." Specific disposal statements vary by container type. Check with your local solid waste management authority, environmental agency, or health department to find out whether your community has a household hazardous waste collection program or a similar program for getting rid of unwanted, leftover pesticides. These authorities can also inform you of any local requirements for pesticide waste disposal. To identify your local solid waste agency, search the internet or look in the government section of your phone book under categories such as solid waste, public works, or garbage, trash or refuse collection for your town, city or county. Or contact Earth 911 at 1-800-CLEANUP (1-800-253-2687) or https://earth911.com/. In Illinois, we have a clean sweep program that is rotating annually to various locations across the state that will collect pesticides from private applicators. There is also a state-wide program on recycling pesticide containers that is open to commercial as well as private applicators. If you are still unsure as to where your item should be taken, contact the Illinois Environmental Protection Agency for general information at 217-785-8604 or for the waste reduction unit at 217-524-3300. Once you have located a facility to take your unwanted pesticides, be sure to keep them in the original container with the labels attached. Make sure that the containers are secured in the trunk or in the back of the vehicle and never in the cab. Be sure to keep the pesticides separate from any food or feed for animals. Go straight to the collection site once your vehicle is loaded and drive carefully. Even short distances do not reduce your risk for an accident. Once the pesticides have been disposed of properly, this will ensure that you are able to clean up your space and safely dispose of the pesticides. 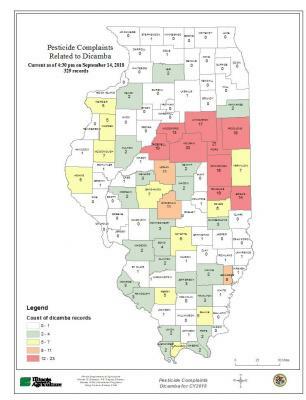 In 2018, 546 pesticide misuse complaints were filed with the Illinois Department of Agriculture. This was 116 more than in 2017. Of these, 489 were agriculture-related with 330 specifically Dicamba complaints. In December only a portion of the complaints that were filed were complete, so at this point, only 2 advisory letters were sent, 112 warning letters were issued, 4 notices of fines @ $750 each, and 57 cases were deemed no misuse or withdrawn. The map pictured shows the distribution of the Dicamba-related complaints across the state. There are many apps available to help make aspects of integrative pest management run more smoothly. Scouting to identify pests and monitoring pest populations is one of the most important steps in integrative pest management and can help determine when applying a pesticide is necessary and which treatments to choose. Unfortunately, identifying pests can be difficult, and tracking your scouting trips throughout the growing season or over the years can be time-consuming. The following apps are designed to aid in pest identification, pesticide selection, and recording of your scouting trips. The ID Weeds app can help with identification of weeds in a variety of habitats. This app asks the user to identify various weed characteristics such as weed type, stem shape, leaf characteristics, and the scouting area, and then suggests a variety of weed species with those characteristics. The user can then complete the identification with descriptions and pictures of each weed. The user can also browse all of the weed species in their database or search for a specific weed species. The weeds database in this app includes species in agricultural, pasture, turfgrass, landscape, rights-of-way, and aquatic areas. The level of detail this app offers for weed identification can give beginner and experienced applicators the opportunity to learn about weed characteristics and become more confident in their ability to identify plants. ID Weeds was developed by University of Missouri, Division of Plant Science, and is available on Android and iPhone. The AgroBase app allows the user to browse weeds, plant diseases, insects, and pesticides by crop. If the user searches by pesticide, the app provides some general information about the pesticide, allows a download of the label, and gives a list of the pests the product can be used to control. If you search by pest, the app provides some descriptive information about the pest and a list of pesticides that can be used to control that species. One drawback to this app is that not all of the labels are the most recent version, so always be sure to read the label that comes with your pesticide. This app was developed by Farmis, which offers a suite of apps geared toward farmers around the world, and it is available for Android and iPhone devices. Developed by Purdue University Extension, this app allows the user to identify the rough age of their turfgrass (new, 2-10 years old, old), the type of damage they are experiencing, and the time of year, then the app suggests pest species that may be causing that damage. At that point the user can view images or read descriptions of the pest and its damage or choose "solutions" to learn about management for that pest. This app offers information about insect pests, weeds, diseases, damaging abiotic factors, and nuisance animals in the Midwest and Eastern US. If you still cannot determine which pest is damaging your turfgrass, this app can get you in contact with turfgrass experts at Purdue Extension or plant clinics in most states. The app does not provide the contact information for the plant clinic at University of Illinois, which is available at https://web.extension.illinois.edu/plantclinic/. This app is available for Android and iPhone devices and costs $1.99. Purdue also offers similar apps for trees, tomatoes, and annual flowers. Xarvio aids in the identification of weeds and recording of scouting trips. This app allows the user to snap a picture of a weed, diseased plant, or foliar damage from insect feeding, then provides identification of the pest. The user can record notes about scouting trips to their field sites. The weed pictures submitted will be tied to their GPS location in the field so you can keep track of problem locations or problem weeds year after year. This app provides identification of weeds but does not offer information or pesticide recommendations for those weeds. The app was developed by BASF and is available for Android and iPhone devices. Scouting for aphid economic thresholds can be frustrating because it often requires counting significantly larger numbers of insects than most other insect thresholds. For soybean aphid, this can mean counting 250 or more aphids on many soybean plants, which is time-consuming. The major benefit of the Aphid Speed Scout app is that it helps the user quickly identify the number of aphids on leaves. This app gives some examples of what leaves look like when different numbers of aphids are present, so you can make a quick estimation of the number of aphids on soybean leaves. The app also allows the user to set reminders to scout and record their scouting trip. Some of the features on this app are not very intuitive but each feature is explained when you choose the "more information" option. This app was developed by University of Nebraska Extension and is available for Android and iPhone devices. University of Nebraska Extension also offers a similar app for scouting western bean cutworm. The EPA is phasing in key restrictions and label changes for paraquat products due to the disproportionately high number of deaths resulting from accidental ingestion of the highly toxic herbicide compared to similar pesticides (17 deaths between 2000 and 2016). Only certified applicators who complete an EPA-approved paraquat training program will be able to apply the material; direct supervision of uncertified applicators will not be allowed. Applicators must take the online safety training every three years and keep documentation of their successful completion. The pesticide labels have been modified to highlight paraquat toxicity, and to include the new application restrictions and training requirements. Packages will feature new safety stickers, and counter cards with warnings will accompany each purchase. Registrants received EPA approval for their amended labels on November 14, 2018, and they have 12 months to adopt the new labels. In the next phase of paraquat changes, closed-system packing will be required for all non-bulk containers (less than 120 gallon). Registrants will need to submit label changes and/or new product registrations for the closed-system packaging by March 2019, and they will have 12 months from EPA's label approval date to adopt the closed-system packaging. Registrants will be prohibited from sale or distribution of old labeled product after the deadlines, but persons other than registrants may continue to use/sell existing stocks until exhausted. EPA will grant exceptions to the closed-packaging requirement to researchers on a case-by-case basis.